One of Franklin Delano Roosevelt’s foreign policy initiatives during World War II was “The Good Neighbor Policy.” With the United States cut off from European markets, FDR’s administration focused on Latin America to strengthen relations. The policy’s objectives were to increase trade and foster good relationships. But FDR couldn’t do it alone and enlisted Hollywood’s propaganda machine to help. One studio was above the rest when it came to the policy: 20th Century Fox. Their answer to the policy? Carmen Miranda. The Portuguese-born singer gained success in New York which caught Fox’s attention. They put her in the musical Down Argentine Way in 1940. Down Argentine Way was supposed to be a vehicle for the reigning queen of Fox, Alice Faye, but she was replaced with Betty Grable. Down Argentine Way had a lot riding on it as it was one of Fox’s first films to deliver for the policy. It was a huge success grossing over $2 million but the Argentines didn’t see it that way. Like many of the films during this era, it lacked authenticity. Don Ameche and Leonid Kinskey portray Spanish men even though they are both American but hey, they have dark hair, give them mustaches and they’ll be ethnic Fox said. The film is clearly Hollywood’s version of Argentina, no photography was shot there except for maybe some newsreel footage but the rest is clearly on a Fox soundstage. Argentina is a mountainous country but if you watch the Argentina in Down Argentine Way, you’d think it was a tropical paradise. Most troublesome is the portrayal of the Argentines in the supporting cast. In the film, these men are crooked and lazy. These images weren’t created by Hollywood, Hollywood only projected them into the American mainstream. You have to go way back to the Mexican/American War in the 19th century to understand where these images came from. Mexico lost the war but it led to the creation of California, Nevada, Utah, Arizona, New Mexico, Oklahoma, Colorado, and Texas. Mexicans were displaced and found survival by taking low paying, dangerous jobs Americans wouldn’t do. Eventually Americans felt threatened and began branding Mexicans with awful characteristics such as ‘lazy,’ ‘criminals,’ ‘stupid,’ and ‘aggressive.’ Because they thought they would take their jobs, Mexicans quickly became ‘the other.’ It’s a sentiment felt when you watch any of the ‘good neighbor’movies. Fast forward to the 1940’s, the negative reaction to Down Argentine Way didn’t stop Fox from delving deeper into South American stories with its new star. That Night in Rio, Weekend in Havana, and The Gang’s All Here were some of her biggest hits. Unlike Down Argentine Way, her roles in these films went beyond musical numbers. While these films are nothing but good fun (I personally love them), their portrayals of Latin Americans are hard to watch. Carmen Miranda’s characters are all the same: they are fast-talking, short tempered women with jealous streaks and broken English. She is sexualized with elaborate, crop-top gowns accentuating her breasts and very large headwear. But in her performances, Miranda had a self-awareness of this ridiculousness that made you feel comfortable. It was as if she played along knowing this really isn’t how it is where she’s from. The Gang’s All Here gave us Miranda’s most famous dance number, ‘The Tutti Frutti Hat,’ which is basically the Chiquita banana girl coming to life. It is a splashy number with scantily clad chorus girls and some very phallic bananas. While the ‘Good Neighbor’ films succeeding in providing audiences an escape, they only perpetuated Latin American stereotypes that are still present today. Her image is very visible in Latin American festivals such as Carnaval in many Latin American countries as well as gay culture but that isn’t all Latinos contribute to society. But Fox can’t solely be blamed, RKO had Flying Down to Rio, MGM danced around the policy with the Esther Williams’ musical, Fiesta, Republic had Brazil, Walt Disney pictures did The Three Caballeros, and years later our television sets would have I Love Lucy. I don’t think 1940’s Hollywood or the few Latin Americans involved in making these pictures knew these portrayals would have such longevity nor did they care. It’s obvious this was what they thought being a Latina meant. Fast forward to 2015 and what do you see when you look for a Latina? Sofia Vergara in Modern Family, Jennifer Lopez in her music video for her song ‘Booty,’ and Eiza Gonzalez in tv series, From Dusk Till Dawn, only illustrate not much has changed. This post was a contribution to Hollywood’s Hispanic Heritage Blogathon hosted by Citizen Screen. Terrific commentary and a great contribution to the blogathon! Thanks so much, Diana! Thank you for the post. I was first introduced to classic movies because of the Fox musicals with Miranda, Faye, Grable, Ameche and Cesar Romero. I was six and up so I was more interested in the costumes. Since I “looked” more like Miranda, I kind of identified with her although I wanted Alice Faye’s bedrooms. Really I identified with Maria Montez over at Universal. I think they are fun films and honestly haven’t revisited many of them as an adult but from a child’s perspective I just liked the beautiful costumes, sets and actors who were smiling a lot. Great tribute to a very talented lady. 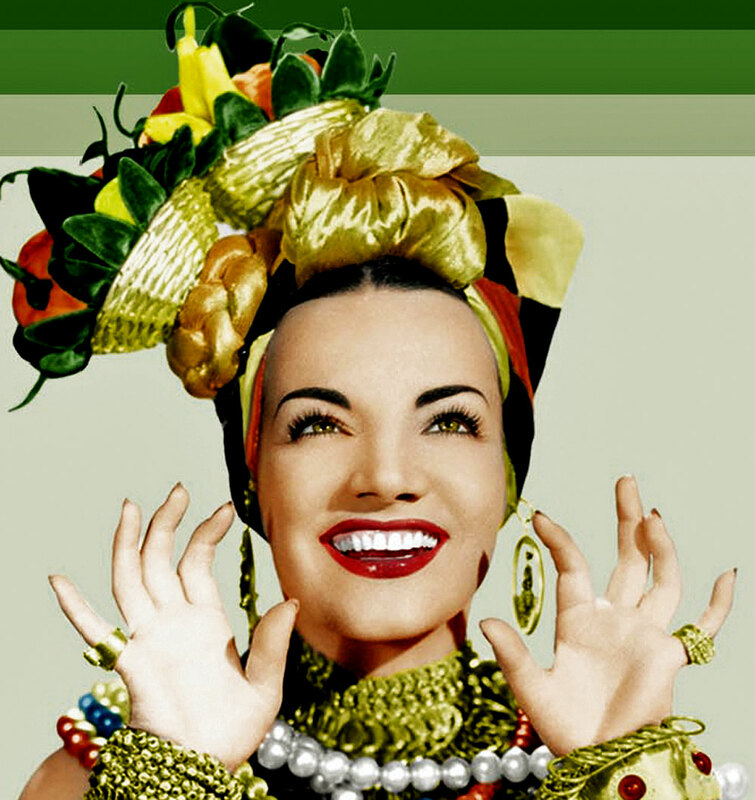 Just the thought of watching that Carmen Miranda clip made me smile. She was so exotic yet so likeable, and The Gang’s All Here was the perfect film for her talents. I agree with your comments about stereotyping, these films cast a long shadow that’s still influential. In some ways, that stops me from enjoying them because I can see how it’s put a certain culture into a box that’s not the right fit but one that we find easy to use. I have to admit I really didn’t become aware of Carmen Miranda until Willard Scott dressed up as her on The Today Show many, many years ago. I then have no memories of her films as a child. Seeing them as an adult I have to admit they are a lot of fun, even as I am aware they relied heavily upon stereotypes common at the time (Walt Disney’s Saludos Amigos and The Three Caballeros did the same). Carmen Miranda had so much charm, although I take your point about how her performances fed into some still-existing stereotypes. Thank you for this post giving more context to her screen image. Great post! I had no idea there were political machinations behind Carmen Miranda’s films. What a misguided attempt at diplomacy.